Taking Race Pants to a New Level. The 2019 AV8 Pant is our most advanced race pant to date. We have gone back to the drawing board and redesigned a pant taking the best of what we do and mixing it with customer feedback. We have added Cordura Stretch in the bum panel. This fabric is not only stronger than our previous pant, it also has stretch built into the fabric. This allows greater movement, less restriction, improved comfort and superior protection than our previous releases. We have also added this Cordura Stretch fabric into the knee. The two greatest stress points on a race pant is always the bum and knee. By incorporating this strong stretch fabric into all new 2019 pants, the all new 2019 AV8 pant is second to none! 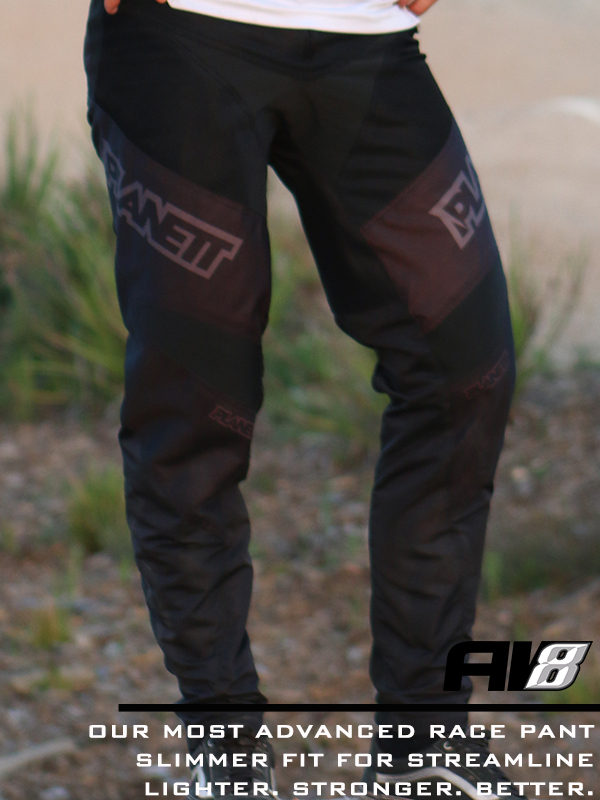 Extremely Light Extremely Tough Planett AV8 Race Pant. Purpose built for extreme sports, this pant has been built for speed, comfort and to be one of the lightest yet toughest pant on the market. These pants have a slim lower leg for ease of movement. Wider thigh area for the power muscles to fit. Upper thigh mesh paneling to draw out the heat and supply rider comfort. Upper knee Stretch paneling. Groin Stretch paneling for ease of movement. Rear Stretch Paneling for comfort. Stronger Bum. The AV8 Pant is around 35% stronger in the bum. This means more protection for when the toosh hits the turf.. Decreased Weight. The AV8 Pant is around 10% lighter in total in comparison to our last pant. Superior Comfort. The AV8 Pant has been designed with a tapered leg for the slim fit. This new design provides less wind resistance during racing to aid in faster times. Increased Stretch. The AV8 Pant has gained larger stretch panels to provide greater comfort... plus.. we have added extra stretch paneling on the hip to provide greater range of movement and flexibility during racing. Extremely Light. Our Air8 pant utilises several different fabrics. Strong 600 Denier Fabric in the crash zones and light mesh fabrics in the body heat areas. Decreased Weight. We have done away with MX Pant trinkets like rubber logos, leather panels, rubber air-inlets. You race bikes not motors! Superior Comfort. These pants are designed with a slim leg race cut. Forget baggy MX pants and get your rear into the right gear. Increased Leg Length. Designed for BMX & MTB Racing, these pants have extra length. Avoid Ankle-Bashers… they just aren’t trendy! YKK Zippered Pocket. Secure pocket added to front hip for key or card. YKK are regarded as the worlds best zip. YKK Zippered Fly. The worlds best zip holding your best bits in. Ventilated Groin. Durable Mesh Panel in upper thigh region for heat dispersion. Inner Membrane. Inner mesh membrane sewn into the leg to increase comfort and sweat prevention. Side Stretch Support. Full hip elasticized stretch design. Double Rear Puller Tab. Awesome little feature that helps pull the pants on with our without gloves. Velcro & Strap Tensioning. Our pants have not only Velcro to get the perfect fit but also Strap Tensions to ensure that the perfect stays perfect. Velcro Locking. Forgot ratchets and Butoon Fly locks. They are too hard to use. Our Velcro Locking Fly works a treat. Sublimated Graphics. Full sublimated paneling to resist fade and cracking. Do not buy motocross pants if you are not racing motocross! We have deliberately taken out everything that is not needed. Leather calf shields… gone! Baggy legs… gone! Heavy weight fabric… gone! Rubber logos to add weight and drag… gone! This is a racing pant not a motocross pant.